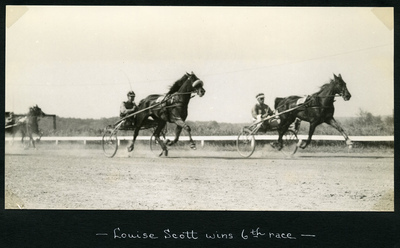 Black and white action photo of Louise Scott and Etta Frisco approaching the finish line in the second heat of the 2.20 Class Trot at the Kite Track, Old Orchard Beach, on Monday, July 8, 1940. Brown mare Louise Scott wearing saddle number six (left, along the rail), J. Phalen up claimed the win. with a time of 2.10 1/2.